The latest theme among the punditry–and once again, one serving conservative interests–is that Barack Obama is a silver-tongued, spell-binding, mesmerizing, messianic orator whose powerful rhetoric is creating a cult of personality. (They really are saying this.) Charles Krauthammer is the latest to weigh in, although largely to summarize his colleagues’ profound insights. One might think it would be an understandable response if the current president had been a model policy-maker, but that obviously is not the case. And it wasn’t that long ago when conservatives were telling us that Ronald Reagan ought to be celebrated for how he made us believe, after the doldrums of the Carter years, that it was “Morning in America.” That message of hope has been conveniently forgotten, it seems. So what’s up? The convention of capable writers attacking eloquent speakers goes all the way back to Plato. In brief, the cautionary note against demagoguery is an important warning in any democracy, but one often used on behalf of oligarchic interests. And there are two very important considerations: whether the charge is correct in the particular case, and what the alternative is. Furthermore, it can be difficult for some people to tell the difference between bombast and eloquence, and the alternative often gets a pass as one assumes that other speakers with different styles are somehow more substantive, or those with less ability are nonetheless adequately effective. 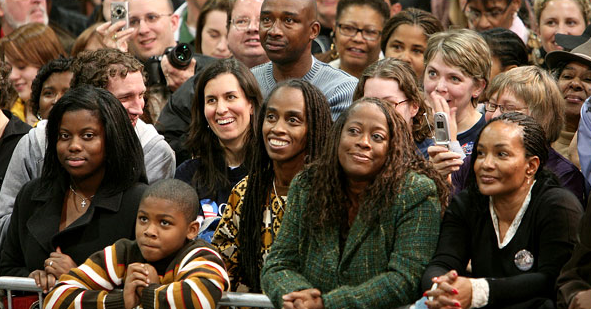 These are faces in a crowd that was listening to Obama last month in South Carolina. I liked this photograph the moment I saw it. That response is cued by the smiles in the center of the frame, but by more as well. To the extent that faces can tell the story, these people aren’t just watching, they are listening and responding, and actively so. They are not being snowed but rather attending intelligently and liking what they hear. They are in a good mood because they are responding in kind to a speaker who respects them enough to appeal to their intelligence and their belief in a good society. They are neither stupid nor poor, nor vulnerable to a demagogue because of that. But that is not the whole of it. The profound beauty captured in this photograph is that they are comfortable with one another. Black and white, young and middle-aged, Southerners all, they are pressed together and yet each is completely at ease. The good vibe comes not from seeing Obama’s luster reflected in their faces, but from who they already are individually and together. This is the America that has been emerging, however fitfully, in that last twenty years. This is the America that wants to hope and deserves a president who can recognize and respect and strive for all that hope represents. Photograph by Jim Wilson/New York Times. You can read all of Lincoln’s First Inaugural Address here. Beautifully written, thank you. I had never seen this quote from President Lincoln. It’s relevant and touching. Wonderfully thoughts, beautifully stated. America is hungry for hope, and wants to believe that the promise of the country’s ideals can finally be reached, which is why Obama is increasingly drawing support from across the political spectrum. His message is particularly resonant after the darkness of the past seven years – I doubt if he would have been anywhere near as well-received in 2000. But coming on the heels of Bush, Obama can’t help but be viewed as a savior. But he’s no demagogue – we clearly see him as an honest, sincere and inspiring man who will work to remove the barriers that are preventing us from becoming a just society. We won’t do whatever he tells us, nor believe everything he says. America has clearly seen the danger of placing blind faith in its political leaders, and we now recognize that we have to change the system ourselves and not rely on the powers at the very top to change things for us. During his famous 2004 DNC speech, Obama invoked “e pluribus unum”, the well-worn phrase whose definition few people ever think about these days: “From many, one.” For me, that credo says everything one needs to know about Obama. talk about the “real America” – this picture is it. Thank you, it is beautiful.